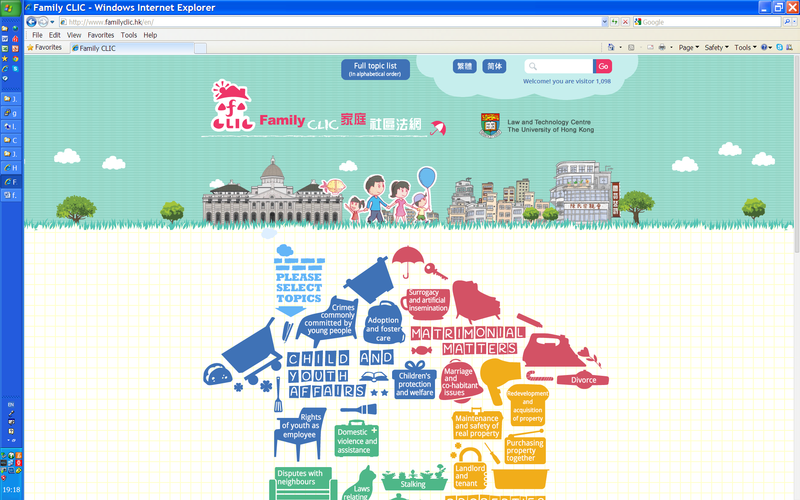 FamilyCLIC, a free website providing legal information on laws relating to families in Hong Kong, was successfully launched to the public on 1 April 2014. FamilyCLIC was designed and developed by an inter-faculty team led by Dr Kevin Pun, our expert on information technology and law. The launch of FamilyCLIC marks the completion of a 3-year community project undertaken by the Law and Technology Centre jointly established by the Computer Science Department and the Faculty of Law. The project has received a funding of over HK$3 million from the Home Affairs Bureau of the HKSAR Government. In pursuance of the project, Dr Pun's team has produced and launched a total of three websites, all catered for users without any legal background: YouthCLIC in 2012, SeniorCLIC in 2013, and now FamilyCLIC in 2014.